Is anyone else's mouth watering or is it just mine? If we start from the beginning, I could tell you all about the prep work and extra hours that went into getting ready for this conference. I could tell you about the masterpiece of a window Belton (our lead craftsman) created to show off our mad skills. I could mention the beautiful stained glass pieces we partnered with Prairie Arts Collective to give away at our booth. I could throw in some details about how we brought our kids up to our facility on the weekend so we could work on the finishing touches of our fully-functioning display window. But we don’t need to talk about all of that. All of those details are what got us to Kansas City. But why did we go to Kansas City? Here is why: Almost 1500 people who are passionate about preserving and growing their towns were gathered together under one roof, and we counted ourselves amongst them. Preserving is what we do. Restoring is what we live for. Sound dramatic? I think not. It only made sense that we would make our presence known and represent our state. We spent three days meeting architects, Main Street directors, members of preservation societies, building owners, preservation coordinators, city planners, and teachers, all the while getting to discuss our favorite thing: saving the history of a building, and ultimately of a town. Morgan talking up a storm at our booth. When you get him on a roll there is just no stopping him. Our experience as a vendor was nothing short of pleasant. 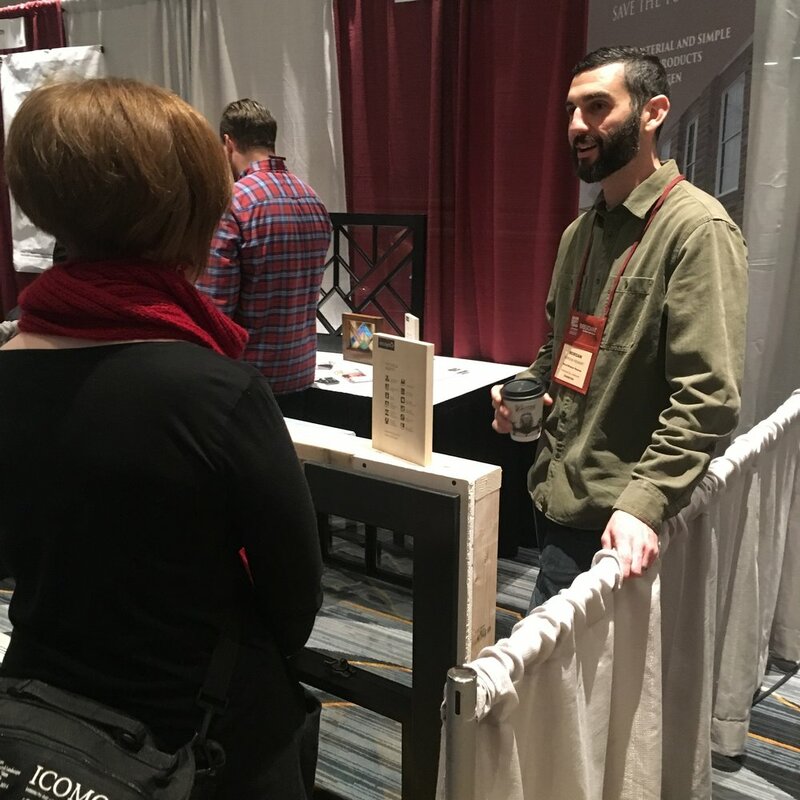 We were welcomed with open arms and embraced by the conference attendees and volunteers; they expressed sincere interest, even excitement, at the idea of us growing our roots in KCMO. Plus, they gave us drinks. So that was cool. With the help of preservation rock star, Elizabeth Rosin and her team at Rosin Preservation, along with the welfare of knowledge from our friends at the City of Kansas City office, and a handful of a others, we are putting a ring on it and committing to offering our services and products to the folks in the BBQ capitol of the world. Maybe brisket can be a new form of payment?? Something for us to think about. Our vision for the Midwest is to ignite a passion for restoration and share our love for all things preservation. We want to show people the importance of repairing the old and cherishing the original condition and craftsmanship of their dwelling. "Vintage is not just a fad. It is not just a look. It is the appreciation and admiration of the true and original design. It’s what are all about." 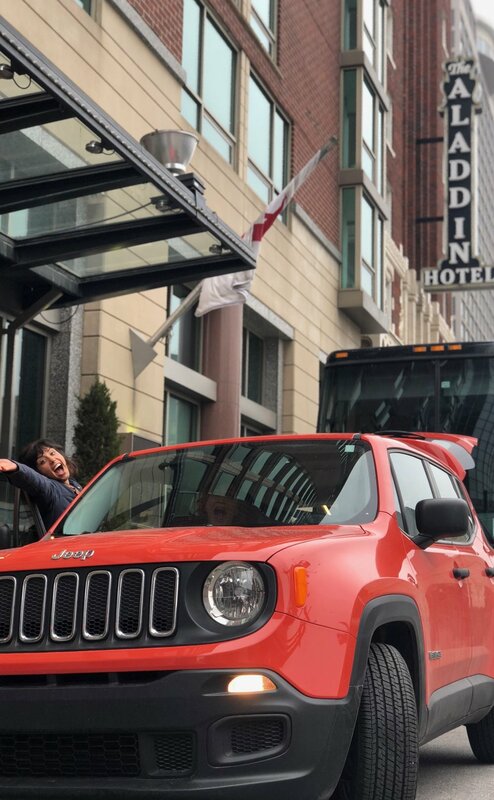 Allison and April were more than ready to go explore KCMO in our Rescue Renegade. We stayed at an Air B&B in the Crossroads District and felt like true locals. It was a quaint neighborhood and cozy home, plus the host left a box of brownie mix that we whipped up and nommed on. We definitely left a raving review for our host. If you stay in Kansas City (or really anywhere) do it like a local and go the Air B&B route. Lulu’s Thai Noodle Shop: a little place right down the road from our Air B&B that did not disappoint our hankering for noodles. The Jacobson: Try the High on the Hog…is bacon and bourbon combined. Joe’s Kansas City Bar-B-Que: There might be a line out the door, but it’s worth the wait for their famous eats. Made in KC Café, for when you need a homemade pastry and a caffeine boost.